Ofcom has today put forward proposals for the automatic dishing out of compensation to landline and broadband customers who suffer from quality of service issues such as missed appointments and delays in installs and repairs. 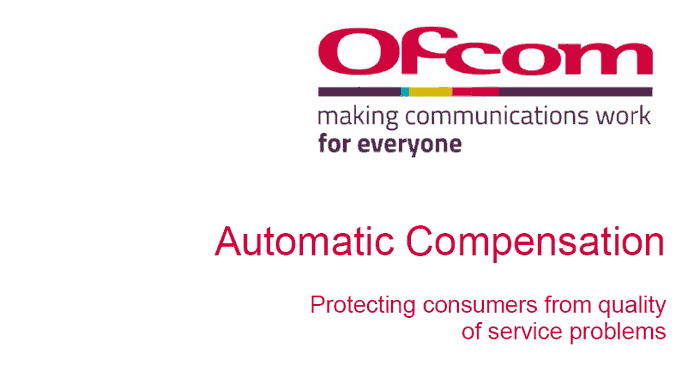 Rather than have to undertake a potentially lengthy and difficult claims process, telecoms customers could instead expect an automatic compensation payment in cash, or more likely as a credit on their bill, suggests Ofcom. An engineer doesn't arrive for an appointment as scheduled. With these proposals enacted Ofcom estimates that 2.6 million people will share £185 million in extra compensation to be paid out each year. The suggested auto payment amounts are shown in the table below. Around one in eight landline and broadband installations were delayed (12 per cent), affecting more than 1.3 million people. At the current time it is estimated that on 15 per cent of those suffering from any of the above quality of service issues receive compensation payments. Ofcom's proposals are open to consultation until 5th June this year. Already BT, Sky and Virgin Media have jointly put forward a draft proposal to introduce automatic compensation through a draft voluntary industry code of practice. However, at this stage, Ofcom does not consider that the voluntary proposal sufficiently meets its concerns, when quality of service falls short. The whole reason they now market it “up to”, I think the tariff should be on a sliding scale. So for that 25Mb they are failing to provide, or I am not able to access, should I be paying for it? I think not, so why not knock 25-30% off my bill. Did they not give you a rundown of what you're actually likely to get? Kinda like how your car can return up to 74pmg, but if you drive like a plum you'll only get 12. This, plus the openreach change, add in a bit of brexit and ISPs will feel fully justified in hiking prices through the roof now. Here is my story with virgin internet. I have 150mbps and always has been top notch, but at some point last month noticed I am getting 50-70mbps. Called up virgin, instantly connected me with support, they asked to reset router and after that did nothing they told me they know about the issue, it has been oversold and needed upgrade to infrastructure which was coming in something like 2 weeks. They told me I will have discount for this. After about 1 week my speed was back up and new invoice came with 8£ discount. Only complaint I have is that unless I would call, I would not get compensation, nor was it said anywhere there is known issue which is why I had to call em.